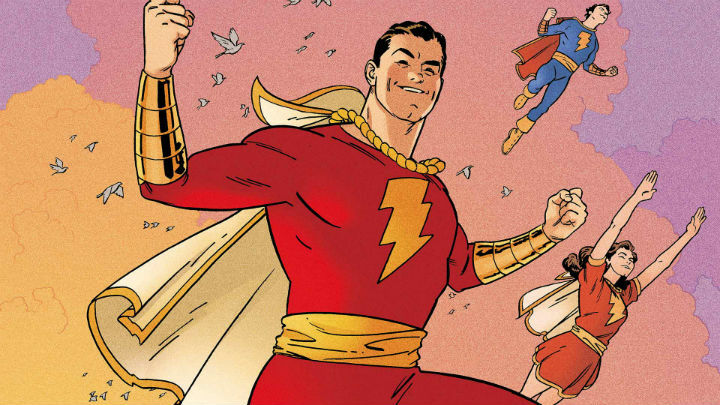 Just like Billy Batson, saying “Shazam!” will finally let you see something happen in real life. Unfortunately, it’s not turning you into the World’s Mightiest Mortal, but rather, it does tie into an expansion of Android’s features. For awhile now, Google’s “OK Google” voice command’s let you do stuff within Android’s core services. Now, it’s being expanded to let you do stuff in a select group of other apps, which includes the music ID app Shazam. By saying “OK Google, Shazam this song,” your Android device will launch the Shazam app and identify the music playing. Other apps included in the expanded voice activation service include: Flixster, TuneIn Radio, NPR One, and TripAdvisor. A full list of apps, and more information, is available in this TechCrunch article. Fooling around with the voice feature, saying “OK Google, Captain Marvel this song” results in nothing happening besides throwing up some Google search results for the term “Captain Marvel”; ditto “OK Google, Captain Marvel Jr. this song.” However, “OK Google, Mary Marvel this song” throws up a few pictures of Mary herself, with Google’s voice feature announcing “check out these pictures.” That’s all working accurately, of course; Google’s voice search feature will only launch whatever app’s stated if it’s been cleared with Google first. I’m not sure if that’ll slow down adaption of the feature, though I’d imagine it’ll spread to include more and more popular apps with time.